The Toronto Bus app brings live bus data for those served by the Toronto Transit Commission (TTC). - Automatically finds the closest bus stop to your location, and display convenient walking or driving directions on a map. 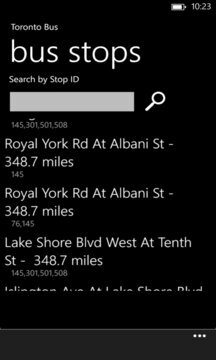 - View real time bus predictions information letting you know when the next bus will arrive at your stop. - View detailed bus route information on a map. v1.6 - Adds bus stops to bus route page. v1.5 - Minor fixes and enhancements. v1.4 - Adds new tutorials, bus route selector and more! v1.2 - Added new bus route page to display the bus route on a map.